I’m going to begin this with two apologies. Firstly, I’d like to say sorry to all those who’ve sent me books in the past few weeks and have yet to see a review materialise. Secondly, I’d like to apologise for breaking the one rule I’ve adhered to since creating this blog/site: that I’d keep my own life in the background and concentrate entirely on the funny books and other forms of fiction. But hey, we make ’em to break ’em. And it’s my bloody site after all. Last week I lost my beloved companion and four-legged muse of the last ten years, Kez. 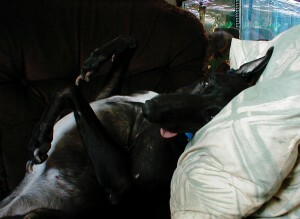 Kez was a gentle, affectionate soul, a tiny black greyhound that won the hearts of all that met her. 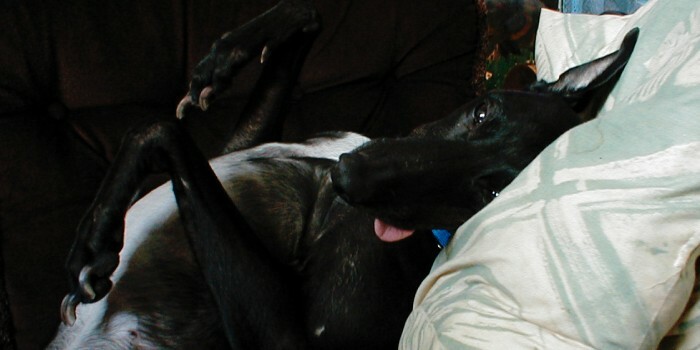 She wasn’t a retired greyhound by definition, in that she’d never actually made it to the tracks, but had been born the runt of a racing litter and treated so cruelly by her breeders that she was covered in deep scars and had a broken tail, a warped spine and teeth so crooked that she couldn’t fully close her mouth. But this external ugliness didn’t stop Kez from being the happiest being to have ever graced my life. Perhaps due to the horrendous conditions she suffered through her first year of life, she truly appreciated the affection we gave her, and would follow my every movement like a fuzzy four-legged shadow. She’d listen intently to every word I said and, presumably due to her brutal beginnings, was one of the craftiest, cheekiest scamps you could ever possibly meet. Keeping your place on the sofa often became a battle of wits. She bore no ill will to the species that had caused her such suffering and absolutely adored children, but her past had given her a fear of her own canine kind. Last week Kez’s breathing became erratic, and what should have been a standard trip to the vets ended her life when she reacted poorly to an antibiotic injection and suffered a severe seizure. I don’t think I’ll ever forget the look of trust in her aged, clouded eyes as she looked at up me and raised her front paw, expecting me to help her, when all I could do was sign away her life. And I’ve been unable to write since. Or read. Or even eat with any degree of passion. Perhaps that’s why I’m writing this, hoping that producing an epitaph for my beautiful brown-eyed girl will help me over at least one of the hurdles of grievance. Those who’ve never had dogs will likely scoff; those who have gone through the same thing will know my pain. Kez wasn’t just a dog, or just a pet. She was a member of my family, a best friend and a unique personality, with her own habits, nuances and tastes (and I’m not just referring to her bizarre love for broccoli). But while Kez’s death continues to upset me, I can take console in the fact that I gave a dog who was once considered deposable livestock a loving home for much of her life. She was adored, she knew it, and she appreciated every bit of affection. It breaks my heart to think of the thousands of other greyhounds that aren’t so lucky. 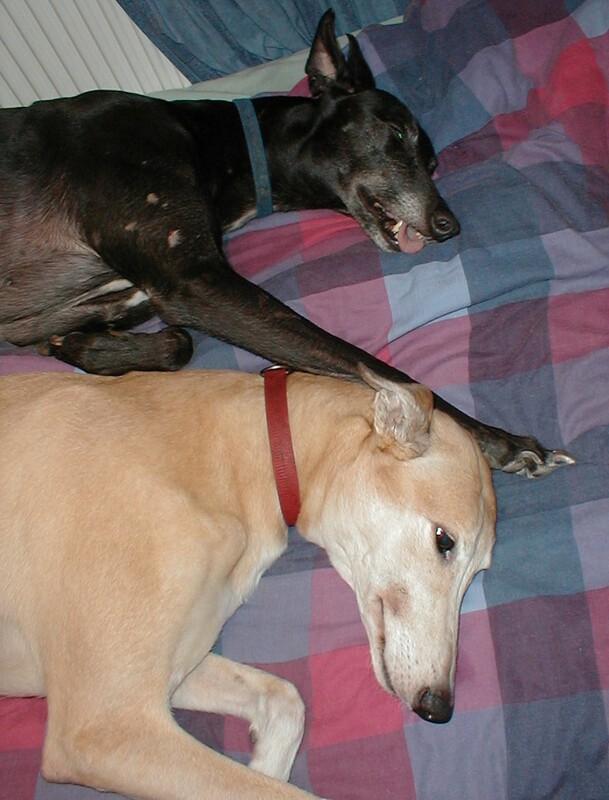 Many animal charities believe that only one in every four or five greyhounds finds a home. The rest suffer all manner of heinous fates. Kez the beautiful black greyhound… with lazer eyes! I don’t believe in an afterlife, or that life is anything but a series of random events, but I do know that Kez brightened up a portion of my own humble existence, and I’ll never forget her. 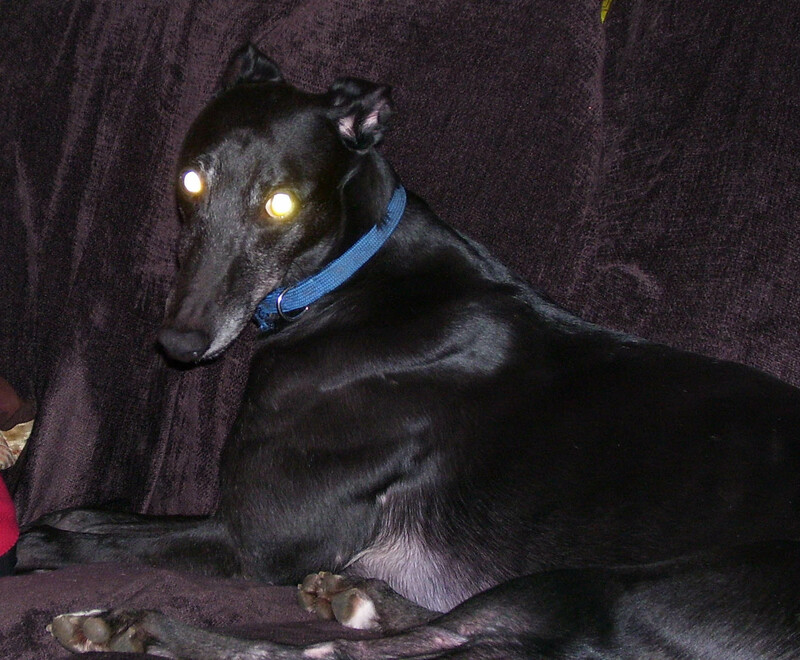 Several years back I planned out a children’s novel that would deal with the darkest depths of greyhound racing, a sort of cross between Brave New World, Animal Farm and The Shawshank Redemption written entirely from a variety of greyhounds’ perspectives; a book that children will not only cherish but look back upon during adulthood and hopefully take action against these atrocities. Now I know I have to go the distance with this idea. I’m aware that sob story accounts about outstanding pooches in the Marley & Me mould are the literary fad of the moment, but I feel that this is a story that needs to be told, focusing on an area of dog breeding that is too often brushed aside in favour of feel-good tripe. I’m aware that Michael Morpurgo has already written something ostensibly similar, and I’m sure it’s very good, but it still appears to follow those clichés a little too closely for my liking. And I know that my research will take me in horrifying directions – the main reason I abandoned the tale several years back – but I’ve always known that I’d eventually have to write this book. Now for the shameless plug: any small publishers (or even big ones) willing to take up the challenge and publish my book? Three months is all it will take me. I’ll even give my share to a small greyhound charity that will use it to home and feed more of these elegant, long-legged couch potatoes. Kez may no longer keep the foot of my bed warm, but she’ll continue to inspire me for as long as I live.